The words ‘I love you’ are literally just words until someone comes along and gives it some meaning. A verbal declaration of love is never enough until you feel like your partner genuinely does love you. In order to show you that they love you, your partner doesn’t have to follow a fixed set of rules. Like, he or she doesn’t have to take you out to dinner every night or leave cute notes around the house everyday. Everyone has their own way and that’s honestly the beauty of love, you can show it in a way you feel most comfortable with. Similarly, your partner can too. Following are some common ways your partner shows love based on their Zodiac sign. An aries is generally really adventurous. They prefer to show you just how much you mean to them by taking you along on their adventures. Think of it this way, your partner is Aladdin and Aladdin would love nothing more than to take Jasmine on a magic carpet ride to show her the world. They act on what they have said in the past by including you in every event they have circled on their calendar. 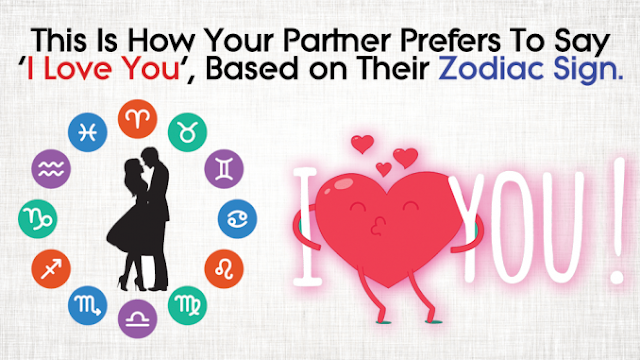 You can often be quite amazed on what your Zodiac sign reveals about you. Mostly since it’s kinda true. A taurus isn’t as expressive as any of the others on this list. To sum it up, a taurus isn’t exactly the type of person to have a heart-to-heart with. If they think of you as a friend, they’ll only tell you about what’s going on in their lives. Like, what they ate for dinner or something like that. They won’t tell you what’s really going on. If a taurus is in love with you then they’ll reveal things which they haven’t told anyone else. Being in a relationship with a Gemini can be extremely confusing at times. You don’t know when they’ll just wake up and think to themselves, ‘this isn’t what I want’ and move on to the next person. It’s quite uncertain. So, when they tell you that they love you, they have to put in a lot of extra effort so that you can finally breathe in the relationship. Being in love with a Gemini can be sort of heartbreaking since they never let you into their lives completely. However, when they genuinely love you, you’ll feel on top of the world. Going with them to every place, letting them surprise you every day and showing you just how much you mean to them. Genuine love with a Gemini can be the most beautiful kind there is. People with this Zodiac sign love showing affection in any and every way possible. They won’t let a day pass without showing you how much they absolutely adore you. That means telling you every single morning, taking you out to dates or just by being around you whenever you need them. Love is actually a beautiful thing and being in love with the right person, the person you see yourself with for the rest of your life, is even more beautiful. Cancerians will go through Hell and back just to make sure that you don’t feel in doubt, ever. The mighty lion, the king of the jungle. Charisma is something no leo lacks. Which is a good/ bad thing: it’s a good thing because you never feel like they’re shutting you out, but they’re never shutting anyone out. Hence, you’re often left wondering whether what you two have is actually love or not. A leo can’t stop being the way they are with everyone else and only act confident in front of you, that’ll go against every inch of their personality. You can never change a person for who they really are. So, you need to act on observation. Notice how they talk to acquaintances or people they aren’t exactly concerned with, their family and you. When you’re at a stage when you can clearly differentiate between the way they treat a close friend and the way they treat you, that’s when you can tell that their love is genuine. Your relationship with a virgo would involve you figuring out what’s going on. Primarily since they’ll never actually tell you that they love you. Love isn’t defined just by words, it’s defined by meaning added to those words. A virgo simply focuses more on the meaning rather than the words. This doesn’t mean that they’ll never tell you that they love you, but they’ll so it in a very subtle way which sounds like they’re implying that, ‘c’mon it’s obvious, isn’t it?’. Truth be told, they’re right. They make it obvious through their acts. They show you everyday by making every single ordinary day special for you. They’ll spend hours just to put in a little (a lot) of extra effort into your birthday or the anniversary. Expressing love isn’t their strongest asset, showing that they do is. Born with the need to constantly have people around them, a Libra will do only one thing to show you that they love you – make it all about you. Their social circle is enormous and you’ll see that they can spark up a conversation with almost any one where ever they might be. Even on a bad day, they’ll manage to fake a smile because that’s just who they are. The fun person, the social person or the active person. In all of this, you can tell that they really love you when it’s you that they can’t let go of. Every other conversation ultimately ends with a ‘bye’ or a ‘see you later’, but not with you. You’re the person they go hone with, the person they show-off and the only person in the room they can’t stop talking to. In a room full of people with everyone at least being acquainted with your partner, they’ll always find their way back to you. A scorpio’s personality is dominated by their tendency to blow off their lid at any thing. They aren’t violent exactly but they get angry quite often. Which doesn’t necessarily mean that they don’t have a soft side or a funny bone in their body but that they are mostly pissed at the slightest of things. In light of this, the only way a scorpio really shows you how much they love you by being protective of you. They can’t bear the thought of anyone hurting you and if they see that you’re hurt, they’ll fight every factor which led to that. They can’t bear to see anything bad happening to the person they love, especially when they could’ve prevented it. Love is shown by a person in a way which they know best. A Sagittarius is blessed with a great sense of humour. Hence, they consider it to be their mission in life to keep a smile on your face. They won’t ever let anything happen to take away that smile. Making you happy every second of your life for as long as they’re with you is their greatest trait. For a person they genuinely love there’ll be nothing better than to see them wake up happy. It makes them happy. If your partner is a Capricorn, you can be certain that you’ve just found your biggest motivator in life. A Capricorn will try to push you towards great things, if you have great things then they’ll push you towards greater things! The fact that you’re amazing just for them isn’t enough to let them sleep at night so they’ll make sure that the world knows just how amazing you are. You might have once revealed to your partner how you’ve always wanted something but at the last moment, gotten cold feet and decided against it. Your partner can’t bear that. They can’t understand how you’d pass over something that you want. They’ll motivate you to achieve all that you’ve ever wanted. They won’t push you towards things which you don’t want for yourself, but if it’s something you deliberately let go off out of fear or because of a lack of self-confidence, they won’t bear that.